I have mentioned in previous posts, we are selling our home in Arizona. When we bought the home, we knew we would need to do some updating. The home was built in 1979 and much of it was original when we bought it. As these things go, we have completed many projects, and some, we just didn’t want to think about. Too much time, too much money, not now, we’ll do it later; always a reason to delay the inevitable. I am sitting here in Phoenix now, while they destroy our bathrooms and put them back together. 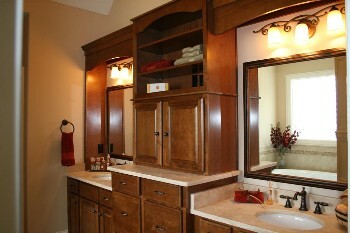 While I have actually enjoyed many of the projects – the bathroms were one of those items we put off. Until now…..now we are selling and we have to get it done. I only regret I didn’t do them while I could enjoy them. You may wonder why we would update and should we just sell at a lower price, deducting the cost of the remodel from the sales price. Maybe! The answer is not the same for everyone. Here are a few questions to ask yourself. 1. How does your home compare to other homes in your neighborhood. Have your neighbors remodeled. 2. What percentage of the cost can be recaptured when you sell? 3. Time is a huge factor. A remodel project can take time, and making those mortgage payments while you are remodeling may not make economical sense. 4. Price point – In certain price ranges, buyers expect specific amenities. If you’re in a higher price bracket, you can expect to either remodel or take a hit on the price. If you are considering a remodel project, check the The Natonal Association of Realtors 2007 Remodeling Cost vs. Value Report. Of course the cost and return factor in the Indianapolis area will differ from Arizona. These are guidelines; not every remodel project has to be a complete overhaul. Since real estate is my profession, I view hundreds of homes a year and see the reaction of buyers in the market to specific items in a home. I can assist you in determining whether a remodel will help sell your home and if the cost can be recaptured in your neighborhhood. Paula, wish I had a dollar for every seller who said, "I wish I had done this remodel earlier so that I could have enjoyed it." Even we Realtors, when faced with ... should I remodel now or later seem to end up in the later category a well. Nothing like living through a remodel...happy holidays! Karl - I agree - most people do not have to remodel, the basics work wonders for any home, especially curb appeal and staging. Ashley - Kitchens and bathrooms tend to be the rooms buyers appreciate when they are remodeled. Of course you would get 5% more! There are a few things to remember in the remodeling or not discussion: Three factors play into a buyers choice: Location, Price, and Features. Sellers can't realistically alter the location of their home, so that leaves price and features. When buyers compare homes of equal price, the one with the best features is usually the one they will buy first. When buyers compare homes of equal features, the one with the best price is usually the one they will buy first. The remodeling cost vs. value report is great information to provide to your clients. Continue to provide your clients with that typs of solid information and sound advice, and you will continue be a great asset to them. Rich - Thanks for your solid contribution to this subject. Your observation and input is appreciated and dead on accurate.